In the 1940s tuition at Yale University was $450; tuition for the average in-state public school is now over $9,000 a year not including room and board which on average will run over $10,000. The Promoting Real Opportunity, Success and Prosperity Through Education Reform (PROSPER) Act has hit the House floor as of this month and it is a doozy. This bill will serve as a reauthorization to the Higher Education Act and seeks to reform the federal borrowing system, university accreditation requirements, and regulatory authority of the Department of Education. The most contentious parts of the bill are the rollback of Obama-era protections designed to regulate the for-profit college industry. For-profit colleges are supposed to provide more vocational training at an affordable price to create alternatives to traditional schools. Between 2008-2017 college tuition has increased 20% in real terms , and this is the first major higher education reform attempt under the Trump administration; the stakes are clear, and both parties have incentives to come together and make a deal. The conflict with the PROSPER Act arises from the rollback of the Obama-era protections designed to shield students at for-profit institutions from predatory lending practices. The current administration strongly believes that deregulation and faith in the private sector will produce the best outcomes for students at a lower cost. Students and student advocates believe that these for-profit schools with questionable accreditation will simply use financially and academically unprepared students to secure millions in federal student aid. This vendetta represents an ideological split on which side should decide the future of higher education: private sector vs. government. The current administration believes that this bill will fill the market with capable workers armed with sorely-needed technical skills. They assert that for-profit colleges create skilled workers at a lower cost than a traditional college while simultaneously reducing the growing amount of bachelor’s degree-seekers in circulation. Meanwhile, progressive groups believe that this bill will allow private institutions to use minorities and non-traditional students (parents, older people, those working full time), to bring in millions in secured federal loans. 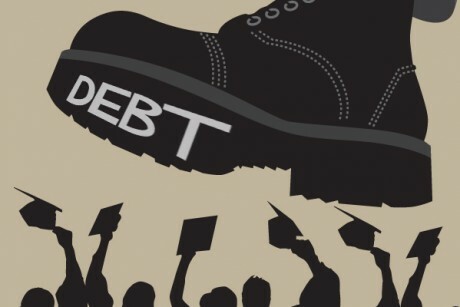 In the eyes of those that support government regulation, for- profit colleges provide high-interest loans that take advantage of the most vulnerable student population with no tangible benefit to participants . The current rules we will focus on that are up for potential repeal are the gainful employment rule, the 90/10 rule, and borrower’s defense. The gainful employment rule dictates that students in degree programs in predominantly for-profit institutions must maintain a standard of financial success post-graduation. This rule is enforced by the debt-to-earnings or D/E ratio correlating monthly debt repayments to income . Borrower’s defense is a special application  that is available to those who have been defrauded by for-profit schools such as Corinthian colleges, Wyotech, Everest, and others. It provides partial and in some cases full tuition reimbursements for students that claim to have been defrauded. The 90/10 rule is a rule that states that for-profit schools can get 90% of their funding  from the federal government and 10% must be from alternative sources. This bill would do away with most of these student protections. In addition the bill calls for the reduction of the power of the government by prohibiting the Education Secretary from adding requirements or new regulations on institutions that do not currently comply with existing regulation. Reducing the government’s ability to govern has had a negative effect on consumers historically. For-profit colleges have been documented and reprimanded for abusive practices with the regulations in place; the first noticeable instances of such chains were following World War II when institutions sprang up to try to cash in on the windfall of dollars from the G.I. Bill. ITT Tech, Corinthian Colleges, and other for-profit chains have been formally shut down and fined, showing the benefit of government oversight. However, government offering of endless and guaranteed loans has resulted in the precipitous rise of tuition since the 1970s and mimics the reckless financing of primary education that may also serve to produce subpar outcomes. Financially struggling state school systems may also adopt the strategy of admitting subpar students for the sake of budget solvency . In order to salvage this debacle we need to err on the side of caution. Deregulating an industry known for shady practices is not going to lead to a healthy and diversified education market. And letting the federal government continue its pattern of impetuous lending also needs some attention. First, the 90/10 rule should be amended to the 70/30 rule. This will hopefully force for-profit industries to raise fee which will subsequently lead to reduced enrollment numbers. The 20% increase in funding not going to for-profit institutions can be spent in a national grant initiatives to provide community colleges with more practical and technical skill programs (as they were initially intended). Next, the federal government has to remain in the loop’ we must allow the department to keep its regulatory authority (for the sake of future administrations). In order to keep these industries accountable we should retain the borrowers defense and gainful employment regulation, and expand it to traditional colleges as well. The federal government should also make an effort to reduce its blind generosity of loans and alter the FAFSA to reflect the reality of a student’s situation. The FAFSA should take into account assets from small businesses, both parents’ incomes (if they are actively involved in the student’s life), the student’s assets and home value, and implement the most recently reported income, all of which are currently ignored. Incorporating these factors into the government calculus should reign in runaway lending. Providing an education is inherently difficult, but when you begin to commodify it you lose the ability to remain objective and ensure quality outcomes. Moving forward we need to see education as a process, not a product.